Vice President Joe Biden discusses the ‘vision’ of the modern day Republican Party or what he calls supporting the “privileged sector.” | STOP Framing "us"
Notice that when we enact policies that favor the “privileged sector”, such as less regulation and lower taxes on the super-wealthy, look what happens. These ‘Tea-party’ policies of less regulation, limited Government, and lower taxes on the so called, “job creators” not only led to the “great depression” in 1930, but also led to our current depression that began in 2008, which nearly led to a global financial meltdown. Both of these periods are marked by vast poverty, needless suffering, and terrible economic conditions resulting from unnecessarily high levels of income inequality. 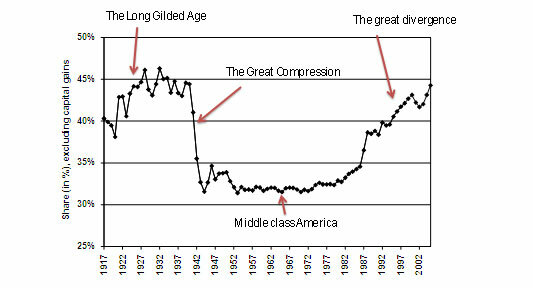 In contrast, the period in the middle of this chart from around 1940 to 1980, reflects a period in our nation’s history when we increased Governmental regulations on the “job cremators”, preventing them from killing American jobs, when we imposed higher taxes on the super-wealthy members of the “privileged sector”, making sure they participated in our Democracy, as opposed to their preferred method of ruling from above, and when we allowed the average working American to participate in the profits they helped generate in both the private as well as public sectors. In reference to Presidential candidates of the modern day Republican party, Vice President Biden had this to say, “I think it’s more than about obstructionism for Mitt Romney and Newt Gingrich, I think they actually believe what they are saying. When they say, let Detroit go bankrupt, let foreclosures happen, poor people have no habit of work, Barrack Obama is the food stamp president. I think it’s not just political theatre, I think they are committed to it.” He’s right! They really believe what they are saying because it’s necessary in order to continue the status quo of income inequality, which coincidentally, further enriches the “privileged sector” at the expense of everyone else.